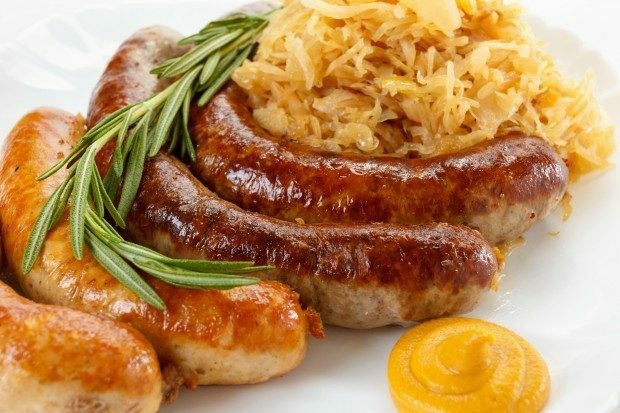 You are here: Home / Recipes / Dinner / German Sausage And Cabbage! Today is baby day for our family. #5 grandbaby is making her way into the world. She is the #1 child for my #3 child. Can’t wait! On to recipes, I was trying not to go to the grocery store the other day. I only had fresh cabbage and then a lot of canned stuff. I have to admit that I am spoiled to fresh veggies. So, I found 3 jalepeno and cheese, German style sausages in the freezer. I don’t remember when I put them there (yikes) but I had an idea that it was in November or December. I decided to cook one to see how it tasted before I added them all to the recipe. They were awesome! Saute the onions and jalapenos in the olive oil. Since my onions were frozen when I threw them in pan, they took a while and produced more liquid. So I used that to help cook the cabbage. So, after the jalepenos and cabbage were tender, I added the garlic cloves and cooked for 1 minute. Then, I added the sausages and cooked them until they were browned. I removed the sausages and added the cabbage, covered the pans and simmered for about 25 minutes. I sliced up the sausage and threw it back in the pan and let it stew in the cabbage. After chopping the potatoes in bite size pieces, I steamed them In another pan with a steamer basket until tender. All I did to season them was to sprinkle them with salt and pepper. These were tasty by themselves because steaming potatoes bring out their flavor but I served the cabbage and sausage over the potatoes. After it was on the plate, I mixed in some Frank’s Hot Sauce to kick it up a notch. One of my friends stopped by and she had some dinner with us, which was such an unexpected treat. At one point, I looked over at my husband and he had beads of sweat on his forehead. My dad used to say that if it didn’t make you sweat, it wasn’t hot enough. I guess this was hot enough with the Frank’s Hot Sauce added. YUM! That must have been really hot!